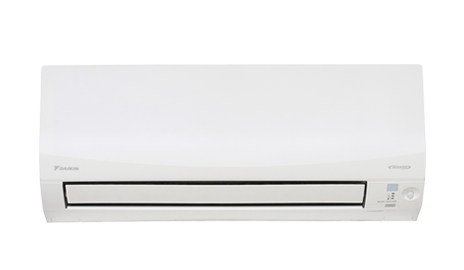 Northern Territory residents are eligible to receive up to $1000 off the cost of replacing their split system air conditioner under the NT Government’s Smart Energy Grants program. The Smart Energy Grant program is a voucher system based on a 50-50 co-contribution (up to $1000), to help homeowners of owner-occupier properties or investment properties make their homes more energy efficient. To assist approved eligible members of the Northern Territory Pensioner and Carer Concession Scheme, the co-contribution is reduced to 25% (instead of 50%), making it more affordable. *The energy efficiency star ratings as determined by the Equipment Energy Efficiency (E3) program shall beused. For further information go to the Energy Rating website (http://www.energyrating.gov.au). 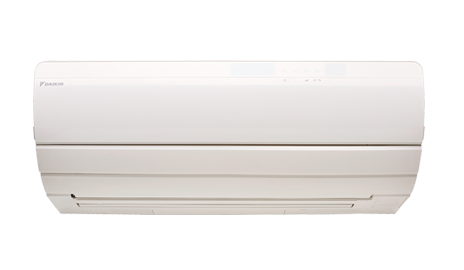 Your local Daikin Specialist Dealer will assess and plan the right replacement split system air-conditioning solution for your property, giving full consideration to the terms and conditions specified under the Smart Energy Grant program. If the solution includes an eligible Daikin split system under the grant, the Daikin Specialist Dealer will generate a quotation. Ensure that quotations are valid for a minimum of 3 months to allow processing time of claims by the NT Government, and quotations include a specific set of information to qualify for application. You (the homeowner) must independently submit the application on the NT Government Smart Energy Grants website. It can take approximately four weeks for the voucher to be issued. Installations cannot occur until the voucher has been received. Vouchers are valid for three months. IMPORTANT: If installations occur prior to receiving the voucher, your application will be void and you will no longer be eligible to receive the voucher. Work with your Daikin Specialist Dealer to plan a day and time for your replacement split system installation. Once the installation is complete, use the voucher as part payment. You are responsible in providing payment for the balance of the cost to your Daikin Specialist Dealer according to the terms and conditions specified in the contract. 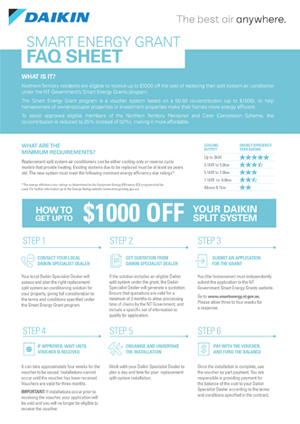 Only select capacities under each Daikin Split System model is eligible for the NT Smart Energy Grant. Download the FAQ Sheet to see eligible units, or speak to your Daikin Specialist Dealer for more information. 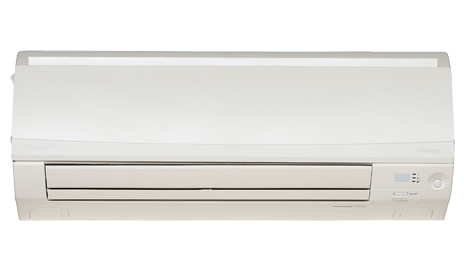 Australia's only 7-star ‘Super Efficiency’ rated* split system delivers ultimate comfort with its humidifying, dehumidifying and air purification features. The NT Government Smart Energy Grant will be running from 2 January 2018 until 31 January 2019 or until grant funds run out, whichever is sooner. All eligible works must be completed by 31 January 2019 and all voucher redemption applications must be receivd by 28 February 2019. Terms and Conditions apply. For full details, go to www.smartenergy.nt.gov.au.